During a televised debate Tuesday on KAET-TV, Yee also accused Manoil of helping to evict families from their homes and his own foreclosure and vehicle repossession proves that voters should not put him in charge of an office that manages nearly $15 billion in assets. Manoil said Yee, who as a state legislator has supported multiple tax cuts for Arizona corporations, is someone who is only “trusted by lobbyists.” Those tax cuts, he said, have made the state far too dependent on sales taxes which now fund more than 45 percent of the state budget, compared to just 2.4 percent from corporations. “Of course not,” Manoil said. Pushed by moderator Ted Simons on whether he has been involved in forcing families from their homes, Manoil said it has occurred perhaps two or three times in the 26 years he has been in the business. Yee then pushed deeper into Manoil’s personal life, citing his loss of a home to foreclosure and repossession of a vehicle. “So you can’t even manage your own personal finances yet you want to manage the $15 billion,”’ she said. “At the time of the Great Recession I had a foreclosure and I bounced back from it, just like many Arizonans,” Manoil said. 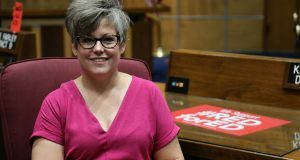 Going directly to the role of the treasurer, Manoil said the office should be using at least some of those resources to directly help Arizonans. What Manoil said he has in mind is having the state partner with banks and credit unions in small communities, something Yee said amounts to a state-run government banking system. “This is socialized banking,” she said. “It does not compete with them but rather enhances their credit-granting capabilities,” Manoil said. The result, Manoil said, is greater access to loans by individuals, entrepreneurs and even local governments seeking affordable loans for infrastructure projects. “I’m actually talking about is banks in towns that have been abandoned by the banks,” he said. Yee pursued the issue, saying that Manoil would use some of the dollars under the control of the treasurer for “social justice” programs, though she provided no specifics. “Oh, you don’t think social justice is something we should be concerned about?” he said. And Yee said if Manoil wants to help set policy he should instead be running for the Legislature. “They are not lending back into Arizona,” he said. Yee defended lending her campaign $400,000, first to defeat Jo Ann Sabbagh in the GOP primary and now in her general election race. Manoil sniffed at that qualification. The winner of the election will replace Eileen Klein. She was appointed treasurer earlier this year after Jeff DeWit, who worked in 2016 on the national Trump campaign, quit to take a job as NASA’s chief financial officer. Klein is not seeking to retain the post.